This is aimed at children aged 5 to 11 years old. Draw 50 Monsters teaches aspiring artists how to draw with ease by following simple, step-by-step instructions. Celebrated author Lee J. Ames shows readers how to draw an array of frightening characters, including werewolves, zombies and warlocks and features well-known characters such as Darth Vader, the Hunchback of Notre Dame, Frankenstein's monster, the Phantom of the Opera and many others. Ames' illustration style and renowned drawing method has made him a leader in the step-by-step drawing manual and the 27 books in his Draw 50 series have sold more than three million copies. Ames's instruction allows seasoned artists to refine their technique and guides amateurs to develop their own artistic abilities. Even the youngest artists can make these spooky characters look great. 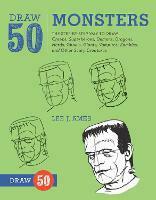 It's easy to draw monsters when it's done the Draw 50 way.